Note that the phone number for the ATDP ASO3, Philip Boys, has changed. The Repatriation Commission recently endorsed the section of Veteran Payment policy which allows for the extension of the payment period under ‘special circumstances’. Veteran Payment provides interim income support to eligible veterans who have lodged a claim for a mental health condition under the Military Rehabilitation and Compensation Act 2004 (MRCA) or the Safety, Rehabilitation and Compensation (Defence-related Claims) Act 1988 (DRCA). Veteran Payment is payable up to 14 days prior to lodgement of a MRCA or DRCA liability claim for a mental health condition, and initially for 42 days following the liability determination. However, the 42 day period can be extended under ‘special circumstances’. Under the ‘special circumstances’ policy endorsed by the Repatriation Commission, delegates should continue payment of Veteran Payment after the liability decision until such time as the veteran has transitioned to another income support payment, or has returned to the workforce. The policy places the onus on the Department of Veterans’ Affairs (DVA) to ensure that the eligible veteran has another means of financial support in place before ceasing Veteran Payment. 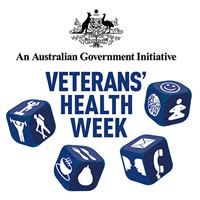 This year Veterans' Health Week (VHW) will be held from Saturday 22 September to Sunday 30 September. The theme is Nutrition. DVA will partner with ex-service organisations and community groups to organise and participate in fun events that highlight the importance of improving and maintaining good health. Events based on this year's theme of Nutrition will help veterans and current serving Australian Defence Force members and their families to eat better and smarter. Good nutrition is essential for an individual's health at all ages. Eating well plays a key role in reducing the risk of developing a range of chronic health conditions. If you would like to attend a VHW event, please review the event schedule for your State/Territory.